These Yellow Plastic Toy Slides (indoor) are particularly cute and themed on a smiling carrot. Chicco toys are always designed and colored to have real appeal to toddlers. This wonderful example of Italian toy design will be a long lasting attraction for your climbing, sliding youngster. Toddlers climb up the slide on a two step ladder. The ladder supports are in the shape of carrots with bright smiling faces. These form a rail on each side of the steps which make it easy for toddlers to climb and encourage a child’s confidence. 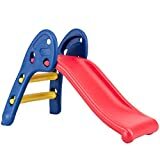 This bright yellow plastic indoor slide has hand guides too.The slide has quite a steep gradient but a toddler can control their descent using these guides. You can be sure they’ll quickly want to slide down as fast as possible. The design of the folding carrot slide makes this a very stable and secure toy. 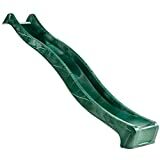 This indoor slide is well constructed in thick durable plastic. It is a safe, sturdy toy that can also be used outdoors. When space is at a premium..
Chicco’s folding carrot slide is really appropriate if indoor play space is at a premium. It’s easy to set up and fold away and is light enough to move easily. A portable carrot. The Folding Carrot Slide by Chicco is not expensive. 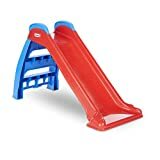 This is a practical and safe toddler indoor plastic slide that will last and engage your child for a long time. Don’t forget – carrots are good for you!